MMNG was never intended to be a fundraiser either for Camp Gaea or the organizers of the event. It has always been run as a not-for-profit event with very modest stipends being paid to significant working staff such as the Coordinator and Cooks. Attendee fees for MMNG are calculated against costs to insure that there are plenty of funds to produce the event without having a lot leftover. This has always meant that MMNG has very low and reasonable fees for those who have wanted to attend. That being said, there is no way to get a perfect balance between the monies received and costs incurred so there is usually some cash left in the pot. Those who attended the early years of MMNG saw a camp that was in very poor shape and the group operating it, Earth Rising, Inc. (ERI), in dire need of money to make the repairs and upgrades needed. It was easy to decide where the extra money raised by MMNG should go. 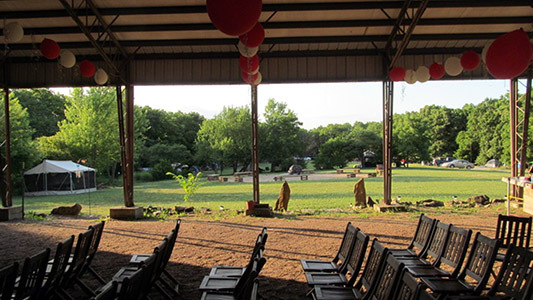 Camp Gaea quickly became the sole benefactor of funds left after producing the event each year. While a few cash donations were given just to help ERI pay the mortgage and insurance, organizers of MMNG review specific requests from ERI and poll attendees of MMNG to determine their needs and ideas before making donations of MMNG funds. The goal is to fill those needs of ERI or make those improvements that best benefit the attendees of MMNG as well. While ERI and MMNG don't always agree on the decisions reached, this win-win situation has proven fruitful to both Camp Gaea and MMNG. There are always more needs, but the improvements made possible this way have made the most of the money paid to MMNG by greatly improving the Camp Gaea facility for MMNG use. Over the years the success of this philanthropy has made MMNG organizers ponder its role with the camp and led many attendees to suggest that they would be willing to pay a little more to attend the event to raise more money for the camp. Instead MMNG decided to promote an annual MMNG Auction during MMNG to raise some extra funds specifically for donating to ERI. This benefit auction is simple and lighthearted yet has raised significant money that is used for MMNG directed donations. In the past couple of years support for ERI and Camp Gaea has evolved with the addition of pre-MMNG work projects. Not only is the money being donated, now manpower is as well. 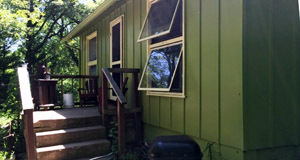 Camp Gaea is a volunteer run and operated facility and some of the projects MMNG has pushed forward need a hands-on touch. It has always been astounding how MMNG attendees just hop in when a need is seen and offer to pitch in. From simple repairs of screens or replacement of light bulbs in the pavilion, attendees seem driven to participate in the support of MMNG and Camp Gaea. This drive has been tapped to complete more significant projects during the pre-gathering period. From laying cordwalks to adding shelving in the bathhouse or spreading gravel at the boat landing, these projects would likely never get done and add to success of each MMNG. Additionally, MMNG attendees have made many personal donations to ERI. The funds available and number of projects vary year to year but it is clear that over the years MMNG has become a respected and welcomed partner of ERI and that everyone benefits from not only from the donations and projects themselves, but the spirit this giving evokes. That goes right to the heart and purpose of the camp and fuels the energy MMNG attendees feel at the event. That connection is wonderful! Cash donations of over $25,000 to the camp have funded Earth Rising's mortgage, insurance payments, pavilion and bathhouse construction. Project and supply donations of over $33,000 have funded the purchase of a reach-in cooler, commercial coffee maker, convection stove, stairs to camping ridge, picnic tables, shelving, dining shelter, boat dock, gravel for parking areas, paddle boat, chairs and tables, swing, and much, much more! If you can help us or the camp with a donation or have a fundraising idea please let us know!